4x4, Back-Up Camera, Onboard Communications System, TRANSMISSION, 8-SPEED AUTOMATIC, ELEC... ENGINE, 5.3L ECOTEC3 V8, Turbo, Alloy Wheels. FUEL EFFICIENT 21 MPG Hwy/15 MPG City! ONYX BLACK exterior and JET BLACK interior CLICK NOW!======KEY FEATURES INCLUDE: 4x4, Back-Up Camera, Turbocharged, Onboard Communications System, Aluminum Wheels Privacy Glass, Steering Wheel Controls, Electronic Stability Control, Heated Mirrors, 4-Wheel ABS. 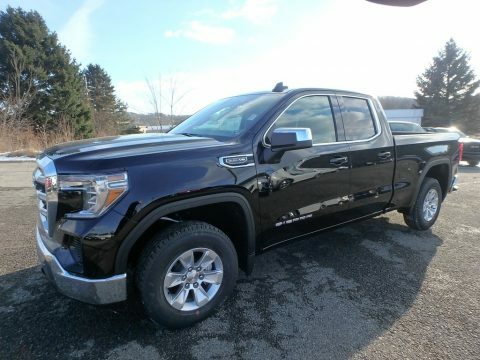 ======OPTION PACKAGES: SLE CONVENIENCE PACKAGE includes (CJ2) dual climate control, (A2X) 10-way power driver seat including power lumbar, (KA1) heated driver and passenger seats, (KI3) heated steering wheel, (N37) manual tilt/telescoping steering column, (USS) 2 charge-only USB ports for second row, (C49) rear-window defogger, (N06) steering column lock, (ATH) Keyless Open and Start, (BTV) Remote Start, (UTJ) content theft alarm, (AZ3) front 40/20/40 split-bench with underseat storage, (QT5) EZ Lift power lock and release tailgate, (UF2) cargo box LED lighting, (KPA) rear auxiliary 12-volt power outlet and (B1J) rear wheelhouse liners, ENGINE, 5.3L ECOTEC3 V8 (355 hp [265 kW] @ 5600 rpm, 383 lb-ft of torque [518 Nm] @ 4100 rpm); featuring all-new Dynamic Fuel Management that enables the engine to operate in 17 different patterns between 2 and 8 cylinders, depending on demand, to optimize power delivery and efficiency, AUDIO SYSTEM, GMC INFOTAINMENT SYSTEM WITH 8" DIAGONAL COLOR TOUCH-SCREEN, AM/FM STEREO with seek-and-scan and digital clock, includes Bluetooth streaming audio for music and select phones; featuring Android Auto and Apple CarPlay capability for compatible phones (STD), TRANSMISSION, 8-SPEED AUTOMATIC ======EXPERTS ARE SAYING: Great Gas Mileage: 21 MPG Hwy. Horsepower calculations based on trim engine configuration. Fuel economy calculations based on original manufacturer data for trim engine configuration. Please confirm the accuracy of the included equipment by calling us prior to purchase.